Apologies for the late post. I have been battling bad weather, injuries and migraines for the last few days, which affected my will to write. But, all good now. 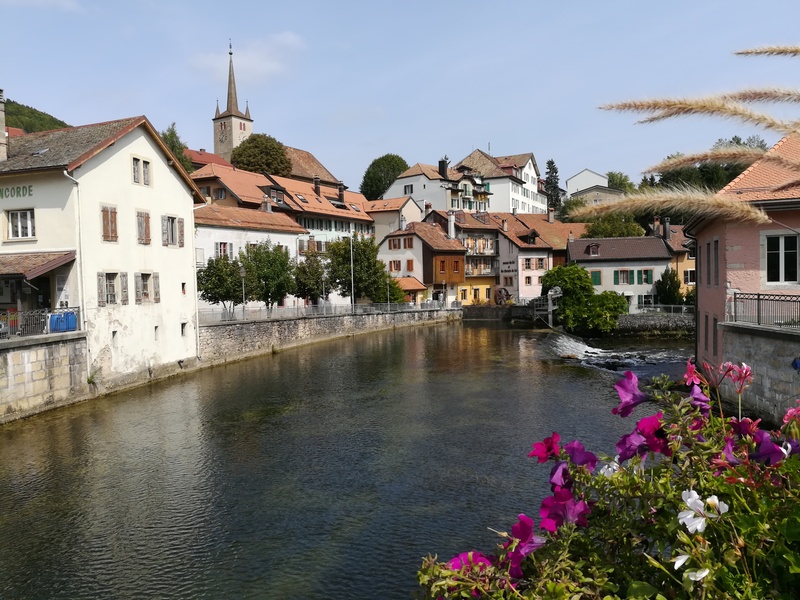 After taking a rest day in Saint Cergue (the first village in Switzerland) and ditching my old shoes, I started the next set of walking days. This set of ten days would lead through a less populated part of Switzerland, with mountains and very few villages. This also marked a string of bad weather days that would last for eight of the ten days. The next village was too far to reach the first day, so I set out knowing that I would need to camp. The path followed a lot of forested trails and high, grassy plains between ridglines. The only landmark the first day was a random hotel/restaurant that I came across at the Col de Marchairuz. The trail was slick but not too muddy, even though there were periodic showers. Camping was very damp and cold, and I delayed my start the next morning to allow my tent to dry a bit. The second day was rainy for most of the day, but it cleared to sun before the descent into the village of Vallorbe. The trail was very wet and parts were muddy. It was nice to finally hit the bitumen outside of the village, if only so the huge chunks of caking mud could disappear from my shoes. Vallorbe had some nice spots near the river that were photogenic. When I arrived at the auberge, I ran into a guy from France that I had seen before. We chatted a bit, and walked most of the way to Sainte Croix together the following day. The day to Sainte Croix was very wet. It rained for the first few hours, which made the path miserable. The trails were largely through the high plain grass of farms, which presented a number of issues. First, the grass was soaked, which in turn soaked my shoes. Second, in spots where the grass was worn through, the mud was like clay. It was very slick and it caked heavily. Third, the farms all had cows, and the cow hooves and cow pies destroyed the trail. It was very hard not to slip and fall. We stumbled across a mountain restaurant, which was a great oasis from the rain. 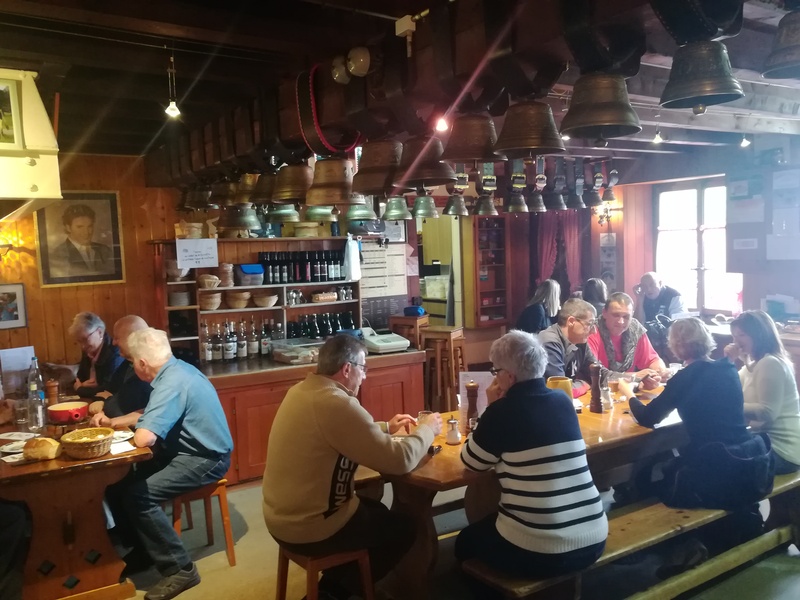 The place was packed, and they specialized in croutes du fromage made with their own cheese. It was rainy, windy and cold for the rest of the day. There was one hotel in Sainte Croix, which I had pre-booked. However, the guy I was walking with had not booked accommodation. The hotel was full, so he was stuck in the rain searching for a place to stay. I’m not sure if he found a place or camped, but I did not see him again. I felt bad for him, but it’s a lesson that I learned some time ago (pre-book if you can, especially during busy periods or if the village only has one place to stay). After Sainte Croix, there were a series of high ridges with amazing views. There were showers again, which made for poor trails. 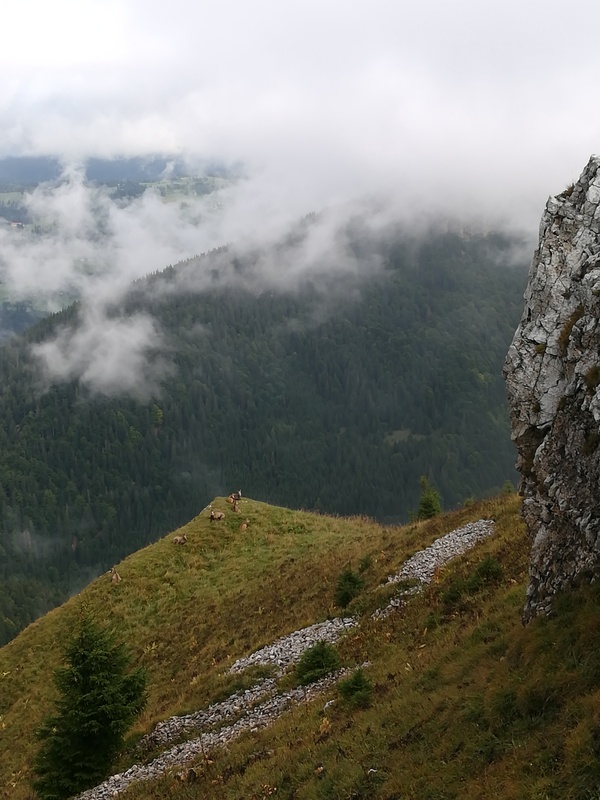 However, the clouds lifted just enough at the top to expose a group of chamois perched on a ledge. This was a spectacular view. The showers continued on and off for the rest of the day, as I descended from the ridge. The trail was in pretty bad shape after several wet days. It was slow going as I fought the slick mixture of mud and smoothed over rocks. I stayed at a mountain restaurant that had a couple of yurts. The restaurant was very busy with car visitors, hikers, mountain bikers and motorcyclists until after dinner. I was the only person in the yurt, and it was nice to have the place to myself. 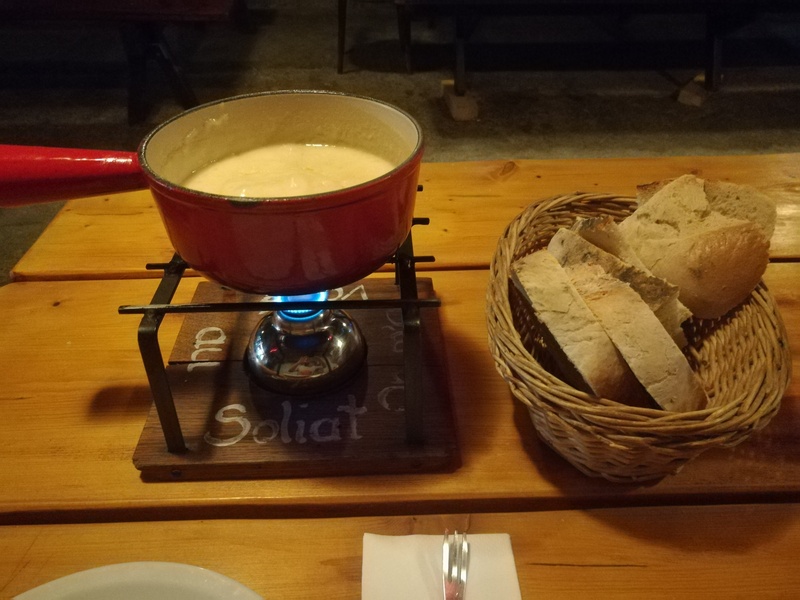 I took full advantage of the fondue dinner because it is rare to find restaurants that will serve fondue to individuals. The slick and wet conditions had taken their toll. All of the defensive walking in the wet combined with several near falls resulted in a torn muscle near the instep of my left foot. This caused limping, and it would “re-tear” every day due to lack of healing time. This is one of the pitfalls of walking for 9-10 days straight and only having one rest day per 9-10 day cycle. If you pick up any significant injuries, there is no time for them to heal properly. You just have to manage the pain and hope your body recovers after an extended period. With the warm yurt behind, I departed on another rainy and very windy day. The wind was challenging after climbing out of Noiraigue to a thin ridge. 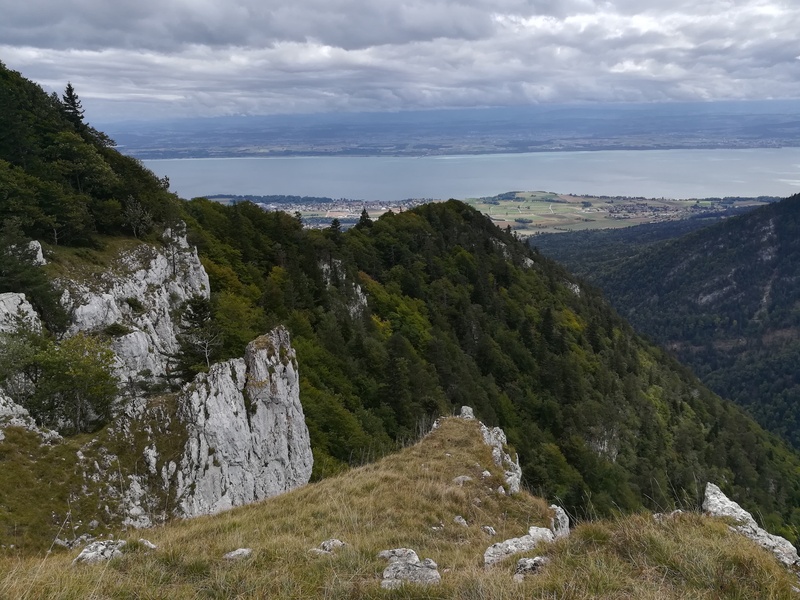 There were some nice views over the Lac de Neuchatel, but it was hard to take photos in the exposed spots because of the wind. The unforested hilltops in the last few kilometers of the day were quite tiring due to the wind. 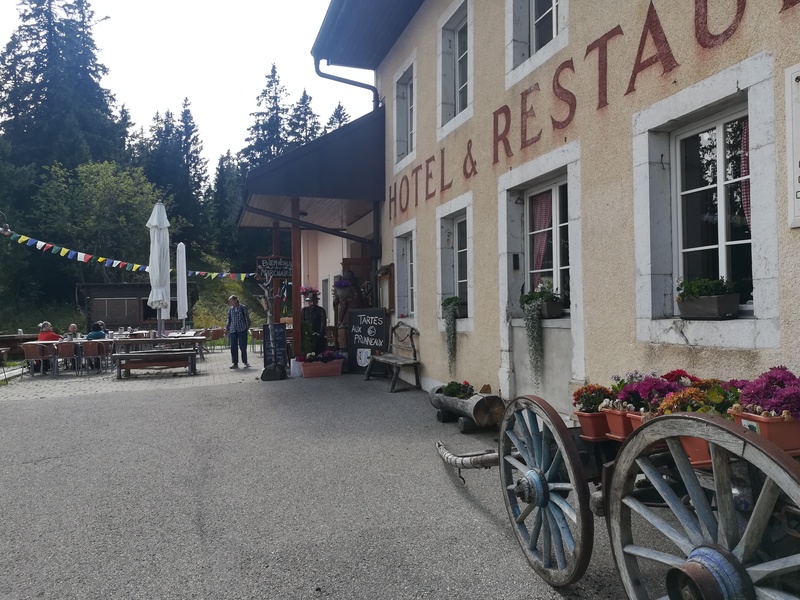 I finally emerged at the roadside stop of Vue Des Alps where I found some shelter at the hotel. No surprise that it was pouring rain the next morning. The weather radar showed no breaks for a while, so I headed out. The rain was strong and the low clouds smoothered any views. The trail was in horrible condition, and I got pretty fed up with the mud and standing water. It was difficult to keep my morale from dropping to the basement after days of bad weather. I had over 40km to do this day, and the overall slowness was hard to manage, but I eventually limped into Frinvillier. 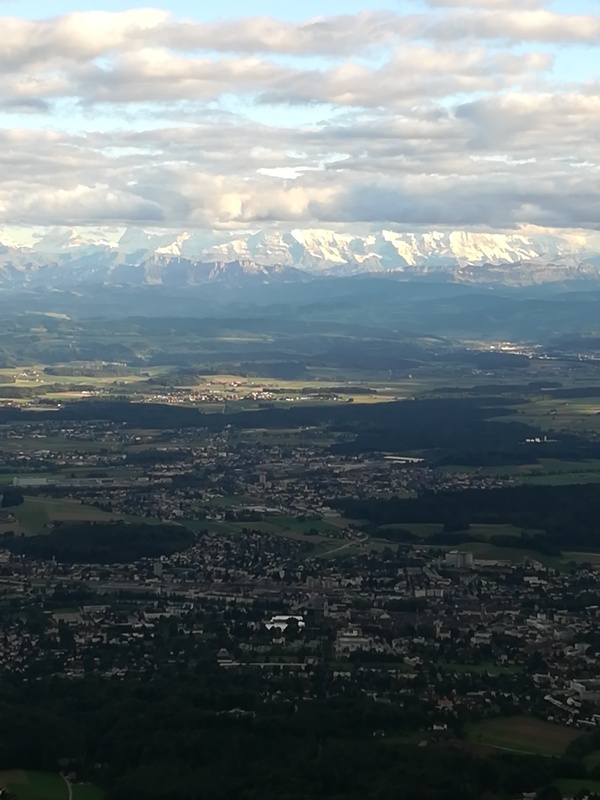 For those of you that are not familiar with Switzerland, roughly half of the country speaks French and the other half speaks German (there are other languages spoken as well, but those two are the most prevalent). Frinvillier was French speaking, but only about 13km out of Frinvillier the language changed. 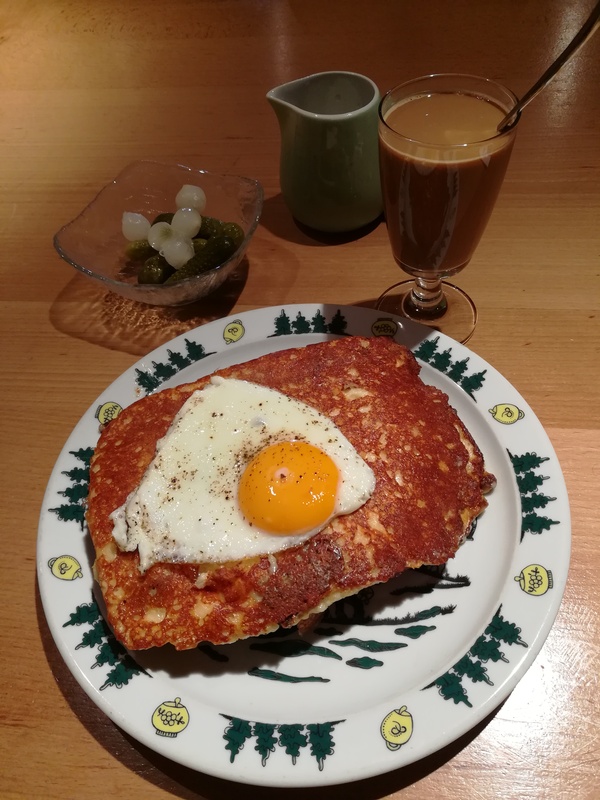 I stopped at a restaurant in Stierenberg, and only German was spoken. The menus and signage were all german-only. It was really amazing how fast the language switched. That marked the end of my French speaking days. 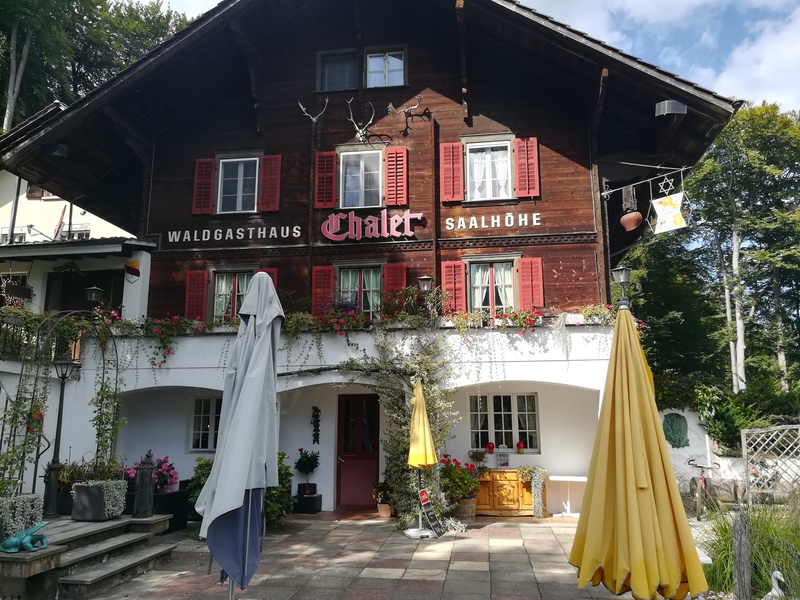 After Stierenberg, the path climbed gradually up to the mountain top hotel at Weissenstein. The hotel faced the Alps, and the clouds lifted just enough to get a peak of the mountains. To my amazement there was a lot of snow, which is not normal for mid-September. Overnight the wind cranked up to gale force. At breakfast, I noticed that the steel tables and chairs on the hotel patio had been overturned and I knew I was in for some trouble that day. I set off in the wind, and it started raining heavily. The rain was stinging, and I was getting welts on my arms from being whipped by the poncho and my pack straps. The wind kept blowing my pant legs up and popping the buttons open on the poncho. It was hard to stay dry as the rain flooded into my shoes and socks. This combined with the terrible trail conditions and my torn foot muscle made for an awful day. There were a lot of fallen and broken trees around. Stumbled into Balsthal at the end of the day, and the nice hotel there was a welcomed refuge from the conditions, although I got some wierd looks while checking in. Maybe it was because I was wet and muddy, maybe it was my poorly maintained beard, I don’t know. 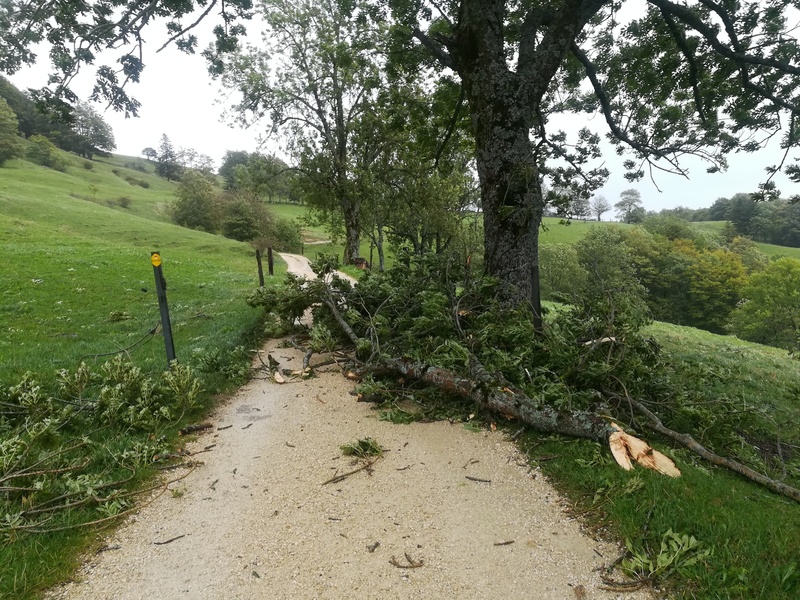 Thankfully, the wild weather leading into Balsthal would be the last of the poor weather before Brugg. The weather for the final two days into Brugg was much improved, and there were a few sun rays about. Good thing, because my body and morale were bottoming out. 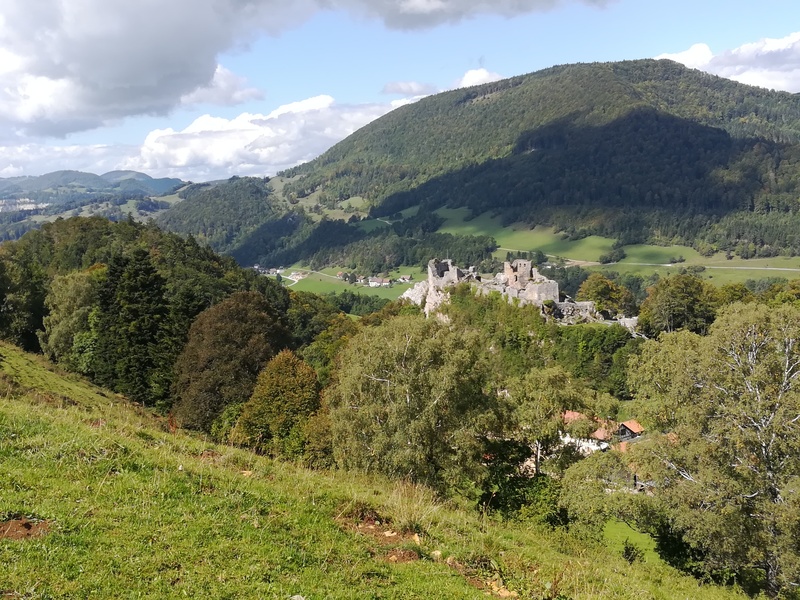 The sweeping views and castle ruins on the day from Balsthal to Trimbach lifted my spirits, even though the trail was still a bit waterlogged. 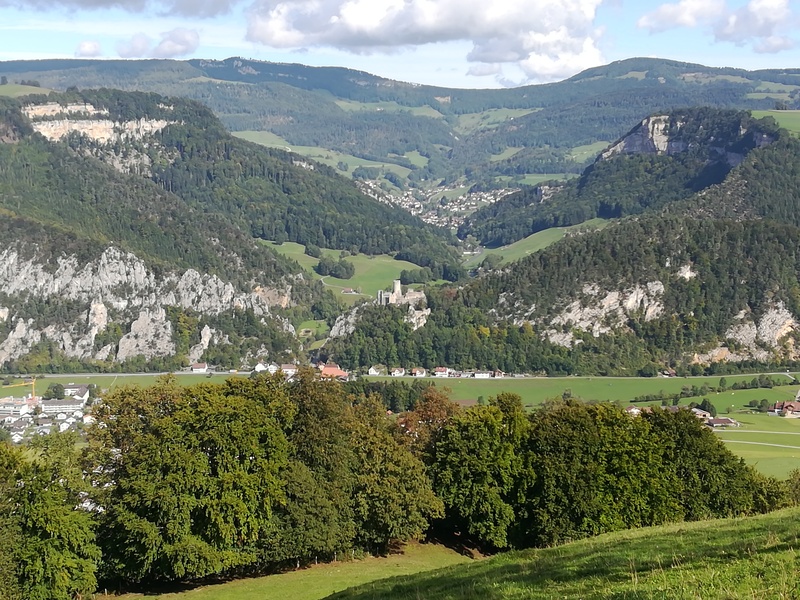 The last day from Trimbach to Brugg was similar. Decent weather and lush green, rolling hills made for some nice walking. 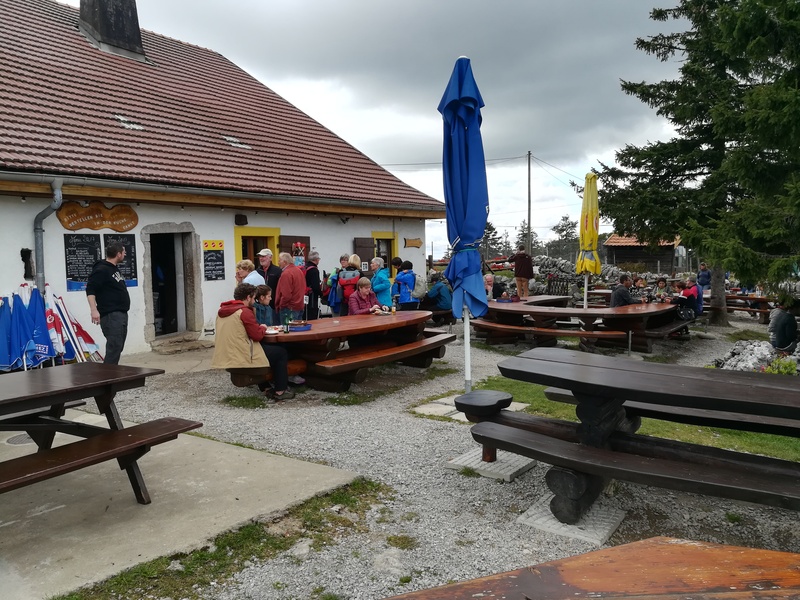 Stopped at the chalet at Saalhohe for a nice coffee break with some other hikers and cyclists. Approaching Brugg, there were lots of people walking and jogging along the trails that overlook the town. Arriving at the edge of the Brugg old town was a nice ending to the day. 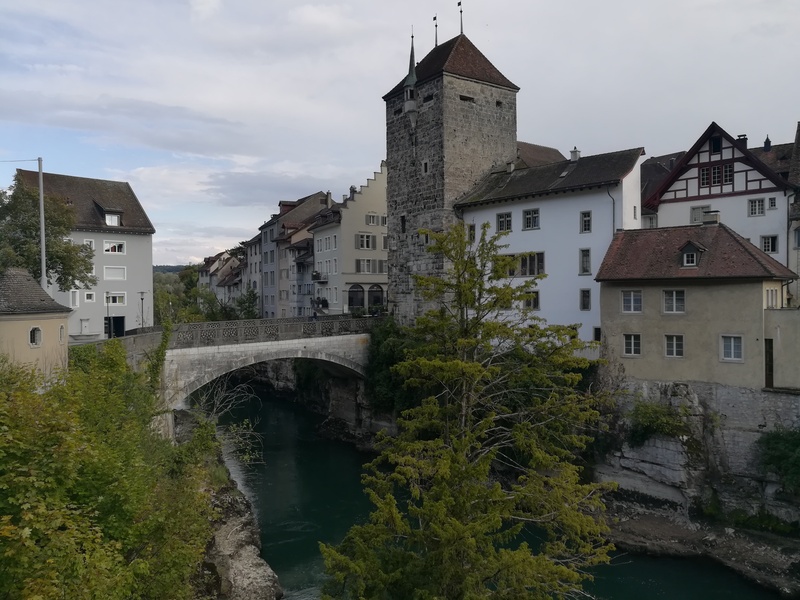 I spent a rest day in Brugg, but suffered from a pretty bad migraine that lasted all day and most of the night. This one didn’t respond to medication, so I just had to ride it out. At least it didn’t happen on a walking day. Congrats on the Portugués Camino de Santiago! I really try to avoid those 40km days, but sometimes I just have to if I can’t find places to stay, etc. It was a bit easier when I could camp, but it’s too cold to camp now (at least with the gear I have). Every person is different, but I find that if I go more than about 32-33km, then my body doesn’t fully recover the next day. I can only string so many of those days together before something bad happens (like injury, exhaustion, mental breakdown). Sorry about that! I noticed that approving comments through the WordPress app does not always carry over to the site. Easter egg. Glad to hear that Parker is doing well. You’ll be looking like me pretty soon. Haven’t weighed myself recently, but pretty sure I’m hovering around 30-35 lbs lost. Good stuff! Just keep using the momentum to get more and more active, and it will keep coming off. Diets are not that important, it’s all about being active. Take care!